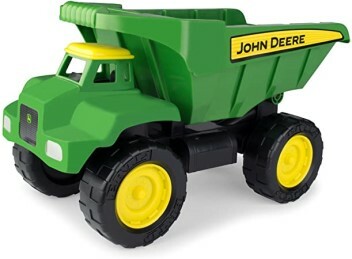 * Take the Big Scoop John Deere Dump Truck anywhere and it will be ready to take on anything! * Ideal for outdoor sandbox play, kids will love loading up and emptying the truck with its easy tipping action! * Giant chunky tyres, free-rolling wheels and high ground clearance give it real off-road ability! * Constructed of tough, durable plastic that's made to last, indoors or outdoors.